China's vice-chairman of the Central Military Commission Fan Changlong told visiting Admiral Harry Harris, commander of the United States Pacific Command, to "stop wrongdoings and dangerous moves" in the South China Sea and to avoid "misunderstanding, misjudgment and unpredictable incidents". "Greater power comes with greater responsibility," Fan said to Harris during his opening remarks in the People's Liberation Army's headquarters on Tuesday afternoon. He was referring to the fact that last year, when the two met in Qingdao, Shandong province, for a China-US mechanism to avoid conflicts when aircraft or warships have unexpected encounters, Harris was commander of the Pacific fleet, a rank below his current position. Harris reiterated in his meeting with Fan that he hoped to "strengthen the cooperation and communication" between the two nations' militaries and push for a "continuous development" of the military relations. He added that, despite the two countries' differences in some realms, cooperation and dialogue are "positive and effective". 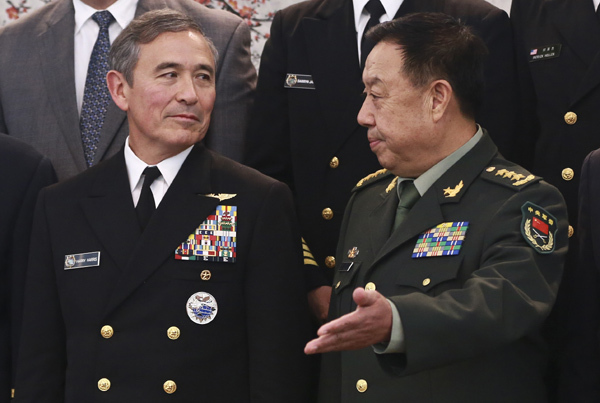 Harris came for his first China visit since he became commander of the Pacific Command in May. His visit comes amid tensions stirred by the US sending the guided-missile destroyer Lassen into waters close to the Zhubi Reef of China's Nansha Islands in the South China Sea last week. Fan told Harris that "China is strongly dissatisfied" with the recent US move in the South China Sea, saying it "posed threats" to China's territorial sovereignty and islands security, and brought "new unstable factors" to regional safety. Fan called on the US to "cautiously deal with" important issues regarding China's territorial sovereignty and push for a "healthy and stable" development of military relations. Harris reiterated the US stance that it does not pick sides in issues related to the South China Sea. "We have 33 interactions between the US military and Chinese military over the next two weeks," Harris said. "So, while there are areas of disagreement, our desire is to continue cooperation and manage our differences." Fang Fenghui, chief of the general staff of the PLA, held an hourlong talk with Harris before the US admiral met with Fan. "We remain resolute in our determination and will to safeguard our sovereignty and maritime rights," Fang said.